The study of Kurdistan and its peoples encompasses topics as timely as today’s headlines and as timeless as the most ancient civilizations. 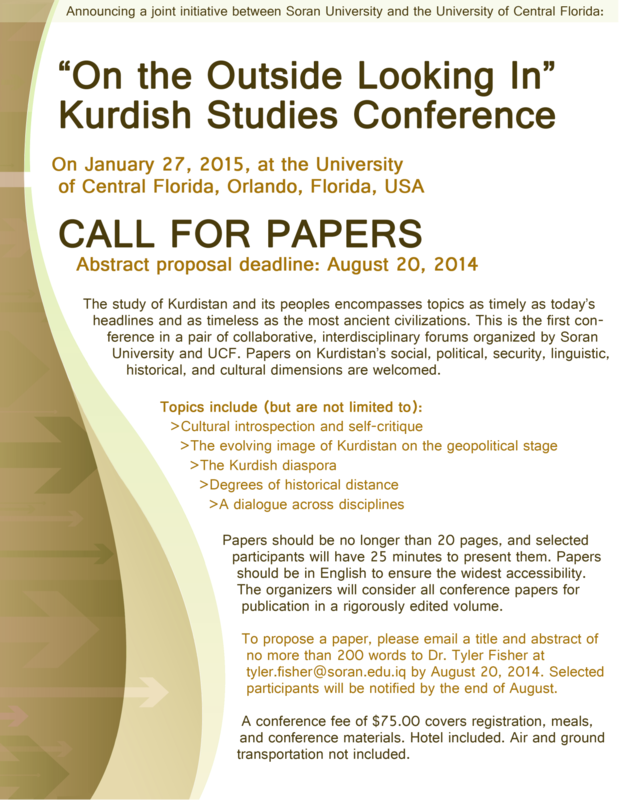 For the first conference in a pair of collaborative, interdisciplinary forums organized by Soran University and University of Central Florida, the organizers invite papers on Kurdistan’s social, political, security, linguistic, historical, and cultural dimensions. In keeping with the conference theme, the organizers particularly welcome papers that deal with questions of cultural introspection and self-critique, the evolving image of Kurdistan on the geopolitical stage, the Kurdish diaspora, degrees of historical distance, and dialogue across disciplines. Papers will be delivered in English and should be no longer than 20 pages, and participants will have 25 minutes to present them. The organizers will consider all conference papers for publication in a rigorously edited volume. To propose a paper, please send a title and abstract of no more than 200 words to Dr. Tyler Fisher at tyler.fisher@soran.edu.iq.